Helping folks buy & sell real estate since 1988! This house has had the extra lot split off of it, which is why the price change. This slice of Durham history is located just one block off the main Streets of Durham. Walking distance to the stores, schools, and library. Built in 1918, this home has 4 bedrooms 2 baths with a laundry room. The garage is was remodeled as a sewing cottage, but has plenty of room to be developed as a separate mother-in-law unit, with a future shower and toilet plumbing put in, already. This cottage features a brand new heating and cooling unit along with new insulation. There is a separate lot available, see “Lots & Land”on Monday. Funky shed in the back yard, and good landscaping. 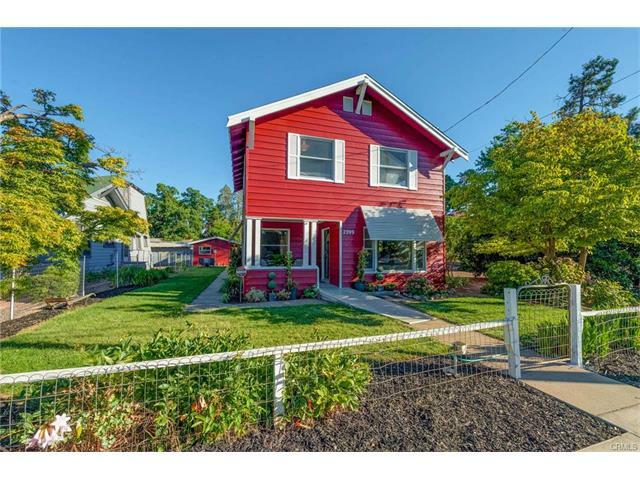 The home has been newly painted completely, both inside and out, and feature a cute chic, 1950’s style kitchen with bright red counter tops. Small kitchen bar with accompanying desk. Incredible storage throughout. Cute with potential. Will have Pest Clearance and Septic clearance soon. We are proud to provide our clients with the highest-quality service available in the Chico real estate market.